Greg writes: It turned out that this was to be a day of firsts! The first first was for Shannon, who was on her first ride with CTC. As an American expat she was thrilled to find herself not alone – both Mark and Lalli soon starting discussing expat life in Cambridge with her. Welcome Shannon – hope to see you on future rides…. After the intros at Brookside we had some ten riders along – Mike, Liz, Mick, Mike CC and Jim. 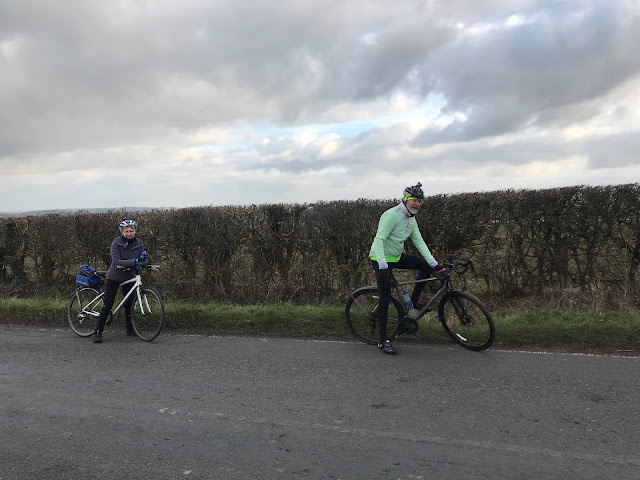 We set off at 1.01pm as we had a meeting to keep – I had arranged with Averil that we would be with her at 1.10pm – and we duly managed to cross Lammas Land (avoiding the cyclist coming towards us carrying a 7ft Xmas tree – another first to see this feat of balance!) and head up the Barton Road and get to her start point at, well, exactly ten minutes past one. We then carried on along Grange Road before turning up the bike path taking us past the West Cambridge site. In due course this led us over the M11 and we turned left just before Coton onto the cycle track past the nature reserve. 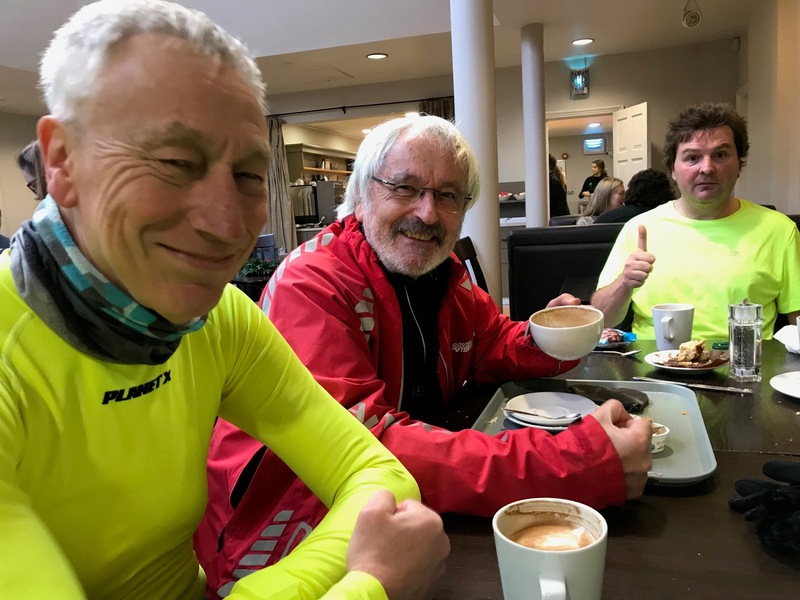 Jim, who has been on very many CTC rides over the years, was besides himself with excitement – for this was a brand new route to him! A first for Jim then. At the Barton M11 junction Averil decided to 'Go her own way'. Somewhat strange this as she had only just joined us – but she went off on her own mini deviation. This necessitated the rest of the group to slow down whilst Greg duly went back to see where she had got to. There was some suspicion that this was just attention gaining behaviour on her part – but we were all together again soon enough and those who hadn't realised Averil had joined us in Grange Road were now fully aware of her presence! We went through Grantchester and threw a hard right just at Byron's Pool to cut across the Trumpington Meadows country park. We emerged onto the cycle path at Hauxton and cycled through Harston to pick up the Haslingfield Rd. By and by we came to Chapel Hill – which Mick had never successfully conquered from this side before. And lo, it came to pass that the waiting group in the lay by at the top of Chapel Hill were able to cheer him on since he managed a personal first for himself – cycling all the way up Chapel Hill. Well done Mick! Chapel Hill summit: All hail the conquering hero! We then raced down into Barrington and who should we find there but a somewhat lost and bedraggled Adrian and Phil. To the best of my knowledge Adrian has never been lost – but here were Adrian and Phil looking somewhat non-plusssed as to where they were and where we had been! They had apparently been 'cycling around' looking for us! Well, given that we had followed the advertised route, had no real hold up and kept a good speed I think we can be absolved of blame for them not finding us sooner! Anyway, the party was now complete and pressed on to Wimpole via Orwell – making good time. The light was bright, the sky clear and the wind light – this really was a very pleasant late Autumn afternoon to be out and about. 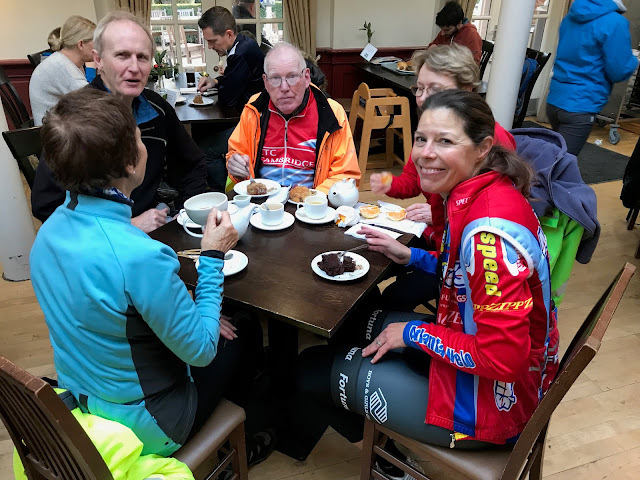 Whilst the other shows clearly what CTC actually stands for – Adrian in recovery mode from his early shenanigans felt the need for both a scone and a slice of cake! Up through Newton and then onto the cycle path beside the A10 – and we headed up towards the motorway. This has just been resurfaced and very fine and smooth tarmac it now is – and surely this is the first time the CTC has been on that path in such a good condition. At the top of the guided busway the group separated. Averil led some back straight into Cambridge whilst the others went via the busway to home.